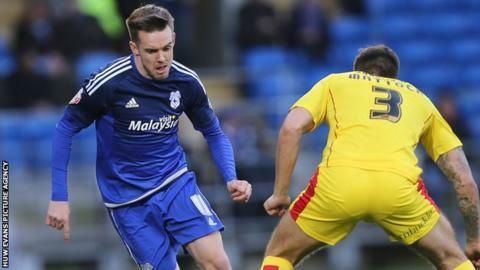 Cardiff City manager Russell Slade has hinted he could bring in a winger during the emergency loan window. Winger Craig Noone has missed the last two games, including Saturday's 0-0 draw against MK Dons, because of a rib injury. The emergency loan window opens on Tuesday, 9 February and Slade is considering his options. "We just have to see if there's anything available," Slade said. "My only concern is with Pilky [Anthony Pilkington] playing up the top at this moment in time because Craig's out at the minute. "Maybe in the next couple of weeks it will be ok but he [Noone] could miss the next couple of games. "We've lost a lot of goals out of the team recently and Craig's contributed six on his own." Cardiff remain ninth in the Championship and five points behind sixth-placed Sheffield Wednesday, who occupy the final play-off spot. The Bluebirds are away to bottom of the table Charlton Athletic next Saturday.